A data analyst or data scientist is a professional who ​conducts ​data​ analysis and interprets results for ​data ​users. The job may sound simple enough at first sight but with the advent of big data, it is a challenging job. Data analysts use variety of data analysis tools to analyze large amounts of raw and unstructured data with the intent to find useful information in it. One needs advanced data analysis training when handling big data from sources such as social media, healthcare industry, internet traffic, and genetics. Data is the new frontier of the 21st century. Big Data is everywhere and there is almost an urgent need to collect, store, and examine whatever data are being generated. This has made data analytics a hot area with experts commanding very attractive salaries. CNBC.com comments that Data Analytics is the sexiest job of the 21st century. Edureka also lists 10 reasons why big data analytics is the best career move in 2015 with the top three reasons being 1) Soaring Demand for Analytics Professionals, 2) Huge Job Opportunities & Meeting the Skill Gap, and 3) Salary Aspects. Data analysts typically have to deal with collection, storage, organization, and analysis of data followed by reporting of the results. In short, you need to follow the SCORS principle. First, start with taking Statistics and research methodology courses, especially techniques in high-dimensional data analysis; Second, master the skills for the data Collection and Organization using SQL databases and other database querying languages; Third, learn to use some data analytics Software such as SAS or R; Finally, develop abilities and techniques for data visualization and Reporting. You also need strong communications skills, both written and oral, in order to share your results with end-users of data who may not be familiar with the technical jargon. Why a Master’s degree with concentration in data analytics? Most data analytics jobs require a master’s degree in mathematics, statistics, computer science, information management, finance or economics with a heavy emphasis on statistical and analytical skills. 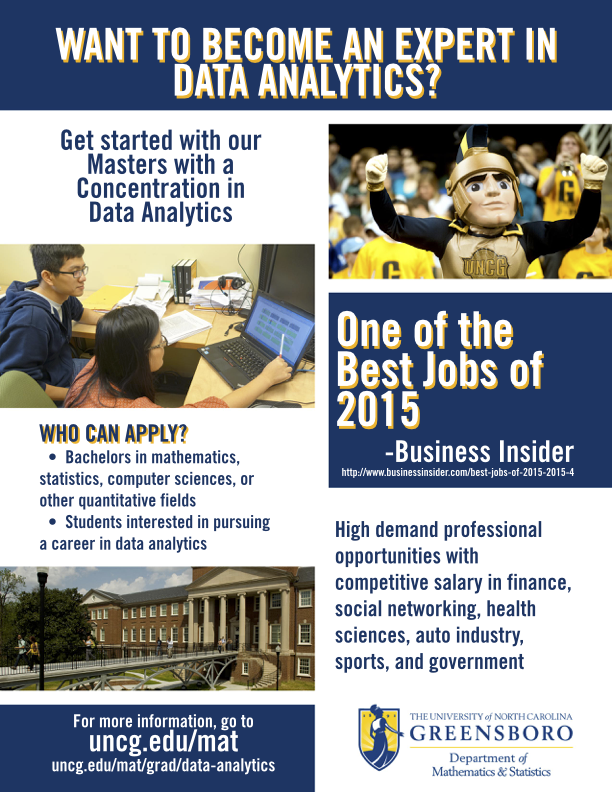 The Data Analytics concentration within the Master’s program in the Department of Mathematics and Statistics at UNCG prepares students with the skills required to pursue a career as a data analyst in the big data world. In addition to providing students with a solid foundation in applied statistical models as well as their real applications, the program offers specialized courses that help you handle complex big data. The program also offers opportunities to take courses from other departments such as Computer Science, Economics and Information Systems. We will encourage students in the program to seek internship opportunities with local entities in finance, social networking, auto industry, health sciences, sports, and government. The Data Anlaytics concentration at UNCG requires a minimum of 30 hours including a project (3 hours) or thesis (6 hours) option. More details can be found in the Graduate Bulletin.